The winter festival will celebrate Acadia National Park and offer fun activities to help people discover and explore the natural world in winter. With two locations over two weeks, and a huge range of events and programs, the festival will offer something for everyone! 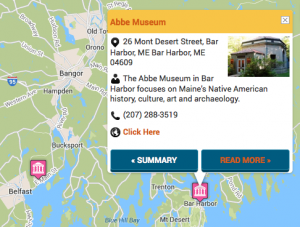 Over 10 days at two primary locations, 20 community partners join together and present more than 50 events to celebrate Acadia National Park and the natural world in winter. Authors, craftsmen, and photographers present workshops and lectures—many events offered free to the public. Outdoor activities for the entire family include music, a winter-themed movie, bird tours, outdoor cooking with a dutch oven, ice skating and more. 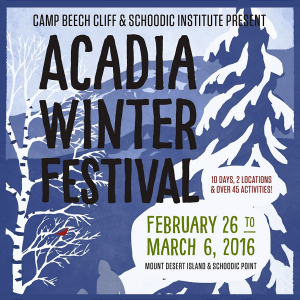 A highlight of the event will be an opportunity to cross country ski or snowshoe with Schoodic Institute President and CEO Mark Berry, and Acadia’s new superintendent Kevin Schneider. Many visitors experience Acadia in the summer, but the national park offers many exciting activities during the winter months. Location: The festival will start on the Schoodic Peninsula on February 26 and then shift geographically to Mount Desert Island for March 2 - 6; ensuring opportunities in both areas and opportunity for participants to attend on two weekends in two different places.